The ‘advert’ above is the first known print ad associated with the label, a quarter of a page, clipped from page 3 of the October 1st issue of Music Week in 1983. Set in Futura, a font that would become a constant in the overall look of the label, it was a short ‘coming soon’ notice before a bigger announcement and mission statement a few weeks later. Even though Art of Noise‘s ‘Into Battle’ was released a week before this appeared, adverts for it wouldn’t run until October 8th ’83. It’s not known exactly what the ‘part one’ to this was but several adverts over the next 6 months would refer to the beginning of the label as the second part of zang tuum tumb records. 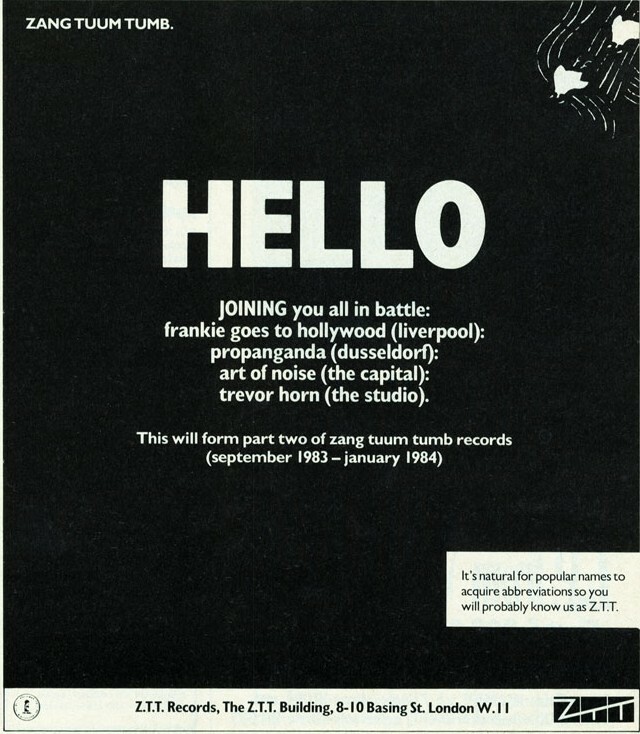 artist: ZTT title: Hello format: Music Week 1/4pg advert design: XLZTT photography: n/a cat. no: n/a date: 01/10/83 art of notes: check the small illustration in the top right corner, several similar examples will feature in various forms over the first few months of the label.